The dollar continues to dominate the yen: over the past three weeks, the pair gained more than 300 points and tested the local maximum of the end of 2017 at 113.65. The main catalyst for the growth of the instrument remains a significant increase in demand for the US currency. Fundamental events also support USD: the rate is strengthened by strong data on the labor market, the growth rate of the economy, and the Fed's decision to raise the interest rate. The yen, on the contrary, is losing ground due to soft monetary policy and negative microeconomic releases. Today one should pay attention to data on personal expenses and US indices. In early October, there will be publications on the labor market and Factory Orders in the United States. In the short term, the upward momentum will be preserved, the pair can reach key resistance levels of 114.00, 114.50, 115.00. In the future, one should wait for a downward correction or the pair's transition into broad lateral consolidation. Despite this, the main scenario remains the pair's growth within the uptrend. Within it, long positions are more relevant. Technical indicators confirm the outlook: MACD shows a significant growth in the volume of long positions and Bollinger Bands are directed upwards. Support levels: 113.15, 113.00, 112.85, 112.40, 112.00, 111.75, 111.50, 111.40, 111.00. 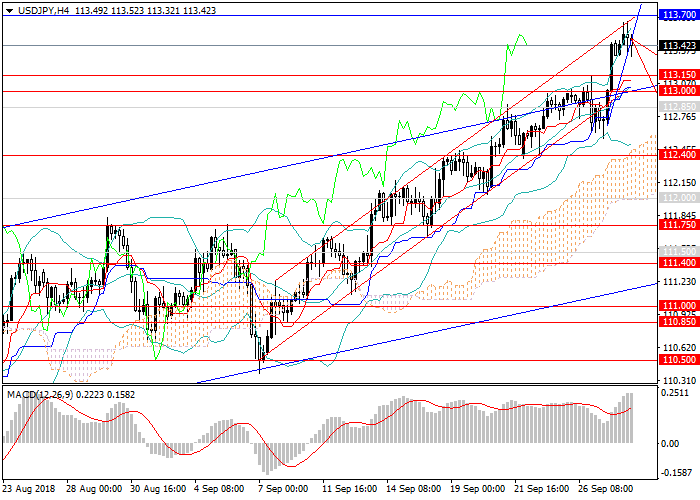 Resistance levels: 113.70, 114.00, 114.50, 115.00, 115.30, 116.10. In this situation, the opening of deferred long positions will be relevant from the levels of 112.40, 112.00, 111.50 with targets at 113.70, 114.00, 114.50 and stop loss at 110.70.